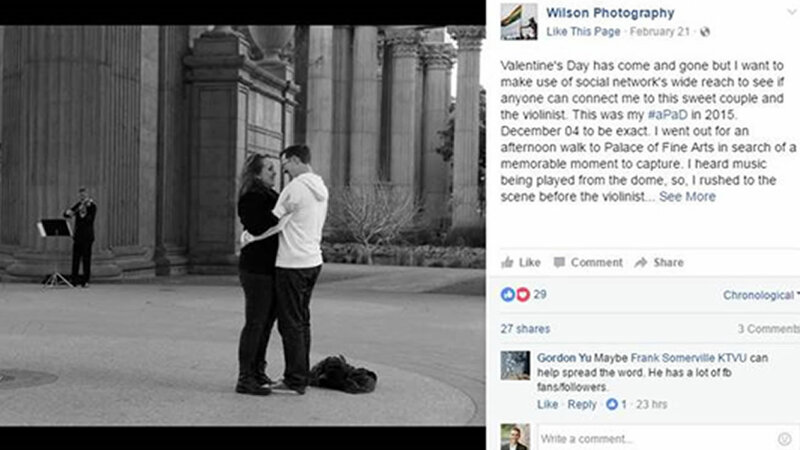 SAN FRANCISCO (KGO) -- A San Francisco photographer is looking for a couple who got engaged at the Palace of Fine Arts in 2015. Angie Viernes Wilson, the photographer hopes to share her magic photo of them with the happy couple, so she posted it on Facebook in the hopes that someone will recognize them. The photo was taken two years ago on December 4, 2015. Wilson says she was out for an afternoon walk when she heard music playing and then saw a man down on one knee asking a woman to marry him. Wilson says she'd like to find the couple and the violinist and give them the memorable photo.